Although I probably didn't need to buy any more make-up brushes I couldn't resist purchasing the Real Technique brushes by Samantha Chapman from Pixiwoo on youtube. I was drawn to the Core Collection purely because of the Buffing Brush people have been raving about however I am pleased to say that I love all the brushes in this set. One thing that makes this set an even greater product for me, is that its perfect for travel! Considering one M.A.C brush is around the £16+ mark, this set is a bargain at £21.99. 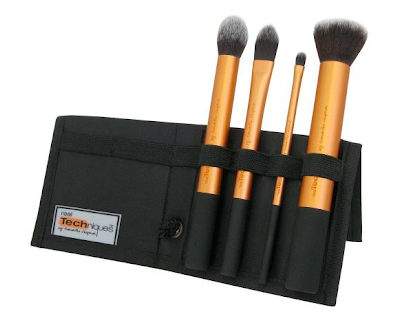 You get 4 brushes for perfecting a flawless base, a handy carrier that doubles up as a nifty brush stand and the carrier also has space to add other brushes if you wish. 'Precision cut to effortlessly conceal problem areas; or use with lipstick for long-lasting shape and definition'. I personally prefer to use this brush for lipstick application as you can really get sharp, defined lips, the brush is petite, compact and very easy to use. 'Use with liquid foundation to build custom coverage'. I find that my foundation is left streaky looking when using a traditional foundation brush like this, however I use this for concealer and it works perfectly to disguise dark circles under my eye area. 'Ideal for full coverage application of powder and mineral foundation'. This brush is so soft and light on the skin, I use it with my liquid foundation and it gives me a natural, glowing finish to my face. 'Delicately applies highlighter to contour or create sheer, soft-focus finish. Not one for applying blusher with I've found, but definitely a great brush for contouring as it gets into the hollows of your cheeks. The quality of these brushes cannot be faulted they are incredibly soft due to the talkon bristles, and just glide on your face. I am so glad I bought this set because I love all the brushes and like I said its perfect for travel. I've not had a chance to wash the brushes so I don't know how well they do wash but as soon as I do I'll let you know. Have you got your brushes from Real Techniques ? If so what's your verdict? Ooh these look great! I need new makeup brushes, will be sure to check these out! Let us know how they survive their bath lol. I have been eyeing these brushes but I was unsure to as whether they would be any good. Thanks for reviewing them.